I prefer to make my own meals and desserts most of the time but sometimes I just want something super quick and even easier. 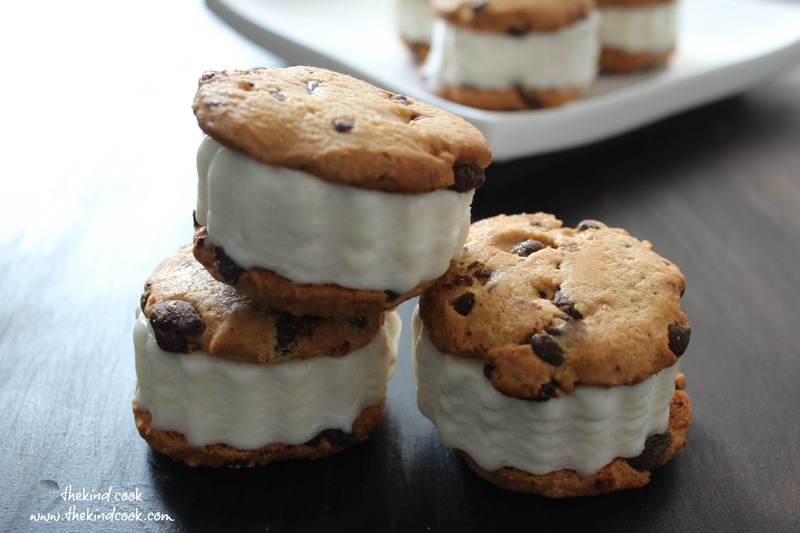 My EASY Vanilla, Choc Chip Ice Cream Sandwiches are just that and they are always a hit! Lay the biscuits on your bench, smooth side facing up. Using scissors cut the ice cream container away from the ice cream. Discard the container. Now cut the ice cream into large slices at whatever width you want your ice cream sandwiches to be. Use a cookie cutter to cut rounds of ice cream from the slices. As you cut each ice cream round, immediately place it onto a cookie and top with a second cookie and pop onto a plate because they melt fast! Once you have finished, place the sandwiches into the freezer to firm up. Then serve. It’s that easy! Use any vegan friendly sorbet or flavoured ice cream. Use any kind of vegan cookie you want. Roll your sandwich sides into sprinkles, coconut or nuts. Dip half of each sandwich into vegan friendly chocolate. Yields: 10 serves. I get 20 small cookies in my packet. Notes: I get my chocolate chip cookies in the health food aisle of the supermarket. They are not only dairy free, egg free and vegan but also wheat free and gluten free.